This book is for everyone who has a father. You may already know what it’s like to live in the rays of such a blessing, to flourish in the marvelous light of a father’s love. Yet, in this “fatherless generation,” it’s also likely you’ve never known the blessing of your earthly dad. The possibility of hearing the words, “I love you, I’m proud of you,” may be gone—washed away by your dad’s death or distance or divorce or disinterest. Your father’s blessing may be mired in a pit of regret, pain or abandonment. But here’s the good news— regardless of how amazing or absent, invested or disinterested, empowering or deflating your earthly father was or is — you do have a perfect Father. We see all throughout Scripture that God wants us to know Him as Father and wants us to live under the waterfall of His blessing. In Not Forsaken, Pastor Louie Giglio invites us to reframe our view of fatherhood, by understanding that God is not simply the bigger version of our earthly dads, He is the perfect version of our earthly dads. And, He’s inviting us to walk in freedom as loved sons and daughters of the King. God is not the reflection of your earthly father; He is the perfection of your earthly father. Louie Giglio is Pastor of Passion City Church and the Founder of the Passion movement, which exists to call a generation to leverage their lives for the fame of Jesus. Since 1997, Passion has gathered collegiate-aged young people in events across the US and around the world. Notably, in 2017, more than 55,000 students gathered for Passion 2017 in Atlanta’s Georgia Dome for one of the largest Jesus-focused collegiate events in history. Each year, Passion continues to see 18-25 year olds fill venues across the nation in pursuit of lives lived for God’s glory. In addition to the collegiate gatherings of Passion Conferences, Louie and his wife Shelley lead the teams at Passion City Church, sixstepsrecords and the Passion Global Institute. Louie is the national-bestselling author of Goliath Must Fall, The Comeback, The Air I Breathe, I Am Not But I Know I Am, and Indescribable: 100 Devotions about God & Science. As a communicator, Louie speaks at events throughout the US and across the globe. He is widely known for messages like Indescribable and How Great is Our God. An Atlanta native and graduate of Georgia State University, Louie has done post-graduate work at Baylor University and holds a master’s degree from Southwestern Baptist Theological Seminary. Louie and Shelley make their home in Atlanta. "The thought that any one of us, no matter who we are or what we've done, can be children of God, called by God, loved by God, and never, ever, ever forsaken by God Himself is mind-boggling, breath-taking, and life-changing. Read this book and be encouraged by a glimpse of who God is that changes everything about who you are and how you live." 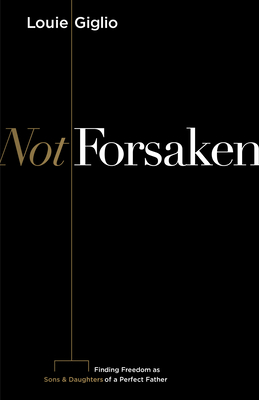 "The unprecedented impact of Not Forsaken originates as a direct reflection of Louie’s life. His radical awareness of God as the Perfect Father is the key to unlocking the freedom and influence of the Christian life. It’s time to clear the fog on our view of God, uncovering the truth and beauty of His nature and walking in the fullness, authority, and intimacy we have been granted." "If you add Not Forsaken to your current reading list you’ll walk away with truth that will leave a significant impact on your life for years to come."